45 years ago, I arrived as an immigrant to Australia, on the ship in the image above! A young child, without any English language skills. I knew a few words, gleaned during our 4-week journey on the ship that brought us here. I knew ‘veg-e-table’ (emphasis on the second syllable). I knew ‘sorrysorry’ (always said twice). I knew ‘howareyou’ – pronounced as one word. And I knew how to introduce myself, ‘My name is …”. On arriving at the start of the school year, a week later, I was put back a year level. It was the prevailing way of the day, of coping with students with language deficits. Once a week we attended a language acquisition class, but for the rest of the time, we learned to cope the best we could. During the ensuing months, I struggled making friends – they were all younger than myself. I also had conflict with the teacher, born out of frustration and boredom. She was a young educator who had difficulty knowing how to deal with me, a child who couldn’t speak the language, but who was streets ahead of her peers in other areas of the curriculum. 18 months later, my language skills having caught up, I was promoted to a class with my aged peers. Because, whilst my language had been poor, my knowledge of other subjects, such as math, was not. NESB students: Who are we? Those born in Australia but who speak another language at home. And so on (Gibbons, 2009). The variations here are endless. What is key for us as teachers to understand, we must not make assumptions about our students’ language ability or for that matter their educational attainments. So how do we go about supporting the learning needs of these children in our classes? The Victorian Department of Education encourages the use of the Teaching Learning Cycle (TLC) with NESB learners, as a way of including students in the classroom learning (2008). Specifically, when the focus of the learning is on reading and writing, as it makes explicit aspects of the genres valued in school literacy. The TLC (also known as the Curriculum Cycle) evolved in the context of the Disadvantaged Schools Program in Sydney’s Metropolitan East Region in the early 1990s. This project focused on supporting secondary teachers in developing their students’ literacy competencies through teaching genre (Rothery, 1994). The framework has since been successfully used to teach NESB students, making explicit aspects of the genres valued in school literacy (DEECD, 2008). The TLC consists of 3 phases, working together to build the students control of skills, language and knowledge. Learning within each is explicit and visible, pitching the student as apprentice and teacher as expert/master (Cope & Kalantzis, 2012). The TLC will resonate strongly for teachers with its Vygotskian notions of scaffolding, as ‘apprentice’ students are guided through each phase of the model, and are provided with support from their ‘expert/master’ teacher (Derewianka, 2015; Martin & Rose, 2005). The teacher can gradually withdraw their support, as students become more confident, moving through the phases, becoming independent learners, ready to start the cycle again. 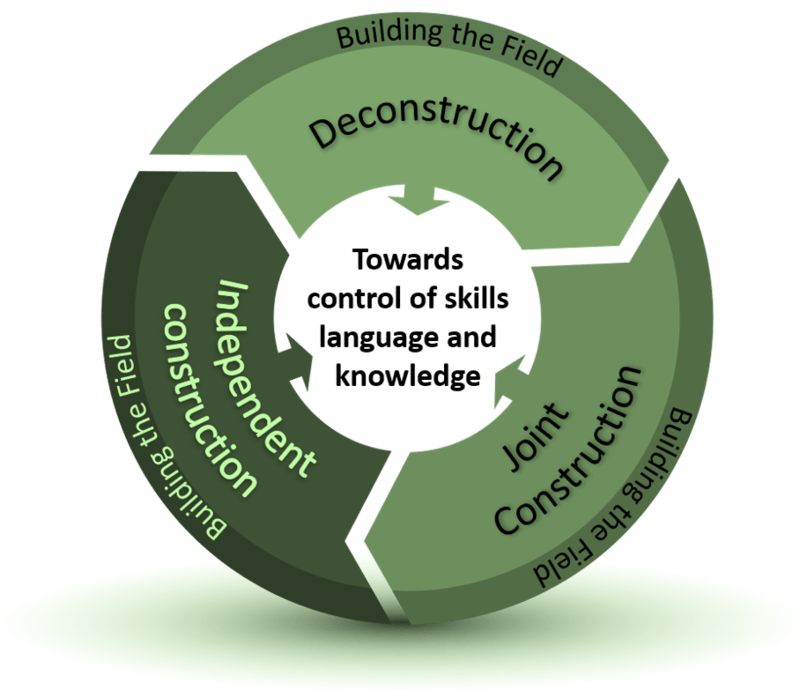 The cycle begins with the first phase ‘deconstruction’. This phase is teacher driven (Derewianka, 2015). In this phase, the teacher spends time both modelling the text type to be learned and being the scribe. They will use this opportunity to make visible the structure and purposes, providing lots of variety of the text and providing similar information from a wide variety of sources, what Hammond and Gibbons term ‘message abundancy’ (Hammond & Gibbons, 2005, p. 16). Students might engage in activities such as exploring vocabulary specific to the text or content, highlighting relevant information or styles, or evaluating perhaps a variety of models of the text type to be learned. The second phase is joint construction – and as the name implies, here teacher and students work together in a collaborative enterprise to create a sample of the text under study (Derewianka, 2015). In this phase, the teacher must still give explicit instructions about the structure, form and function of the text. Students have more control in that they would offer content, and might even develop whole sections of the text, but the teacher continues to set the organising framework. The third phase of the TLC is independent construction. In this final phase the students are ready to do their own work, covering a new content area. During this phase, the teacher will have removed all scaffolding, whilst the students work independently, individually creating a text. However, the teacher continues to monitor the students’ progress and will where necessary, provide support. During each phase of the TLC, students spent time in what has been dubbed as ‘building the field’. These are classroom activities through which students can build up content knowledge for the text type to be learned. When working with students with additional language needs, it is essential to understand the prior knowledge and educational attainments that the student brings to the topic. This will ensure the student feels valued, and their understandings acknowledged. I love using the Teaching Learning Cycle. 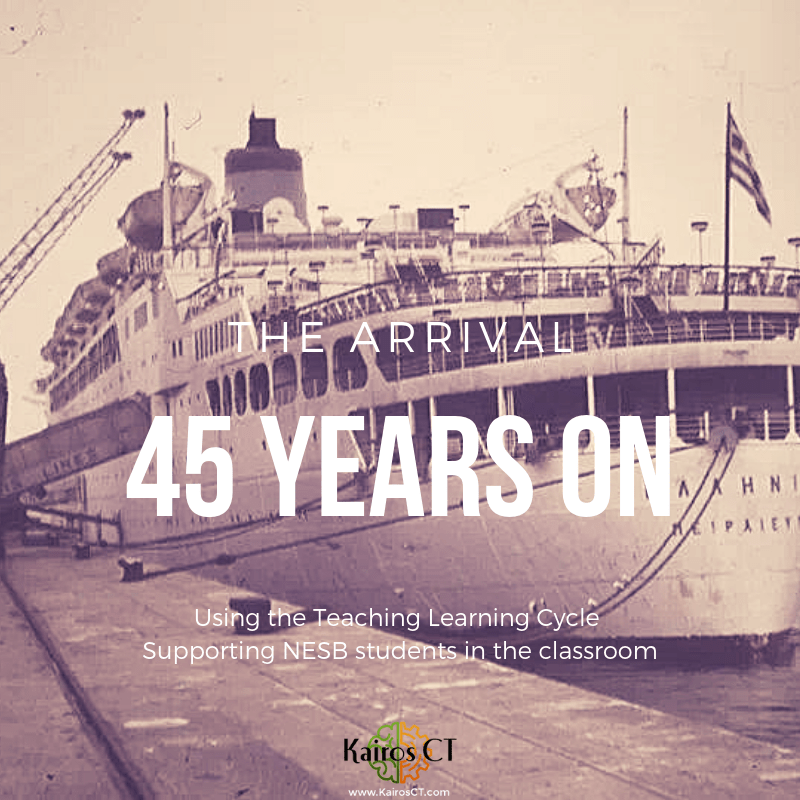 It is very useful in supporting the learning of NESB students either as a group or within the context of mainstream instruction. It is not always possible or even advisable to pull NESB students out of the classroom, so as a teacher we need to include and support them towards full curricular access, ensuring educational equity for all (Coleman, 2012). The TLC, as described briefly in this post, enables teachers to do so, with very additional extra effort, to the benefit of all the students in their classroom. Coleman, J. (2012). The ESL teacher as ‘productive’ pedagogical mentor. In R. Jackson (Ed. ), TESOL as a Global Trade: Ethics, Equity and Ecology (Vol. Special Edition S3). Melbourne, VIC: Australian Council of TESOL Associations. Cope, B., & Kalantzis, M. (2012). Introduction: How a genre approach to literacy can transform the way writing is taught. In B. Cope & M. Kalantzis (Eds. ), The powers of literacy: A genre approach to teaching writing. Oxford, UK: Routledge. Derewianka, B. (2015). The contribution of genre theory to literacy education in Australia. In JanTurbill, G. Barton, & C. H. Brock (Eds. ), Teaching writing in today’s classrooms: Looking back to looking forward (pp. 69-86). Norwood, Australia: Australian Literary Educators’ Association. Gibbons, P. (2009). English Learners, Academic Literacy, and Thinking: Learning in the challenging zones. Portsmouth, NH: Heinemann. Hammond, J., & Gibbons, P. (2005). Putting scaffolding to work: The contribution of scaffolding in articulating ESL education. Prospect, 20(1), 6-30. Martin, J. R., & Rose, D. (2005). Designing literacy pedagogy: Scaffolding democracy in the classroom. In R. Hasan, C. M. I. M. Matthiessen, & J. J. Webster (Eds. ), Continuing discourse on language: A functional perspective (pp. 252-280). London, UK: Equinox. Miller, J., Keary, A., & Windle, J. (2012). Assessing the reading and writing of EAL/D students: Issues and implications. In R. Jackson (Ed. ), TESOL as a Global trade: ethics, equity and ecology (Vol. Special Edition S3). Melbourne, VIC: Australian Council of TESOL Associations. Rothery, J. (1994). Exploring Literacy in School English (Write it Right Resources for Literacy and Learning). Sydney, NSW: NSW Department of Education.